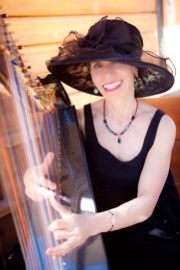 Make memories Easter Day with an incomparable selection of live harp music, brought to you by Grammy® Award winning harpist Anne Roos! She'll play your music requests as you feast on an upscale Easter buffet complete with culinary delicacies and delightful surprises. No need to buy tickets or make reservations--First come, first serve seating begins at 10 am in the Grand Ballroom. Just $34.99 per person. Easter hats are optional, but expect Anne to be dressed for the occasion, wearing one of her favorites.